J Walter Thompson London has teamed up with Creative Equals to place a spotlight on the low levels of women at the top table of creativity. 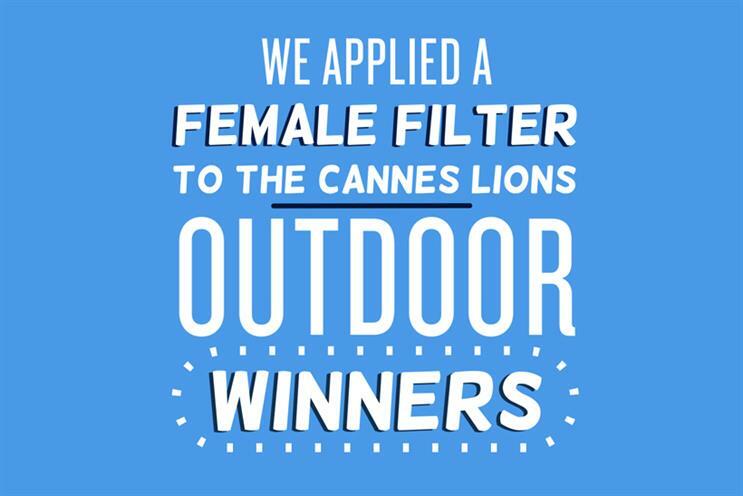 The duo are launching #TheFemaleFilter; a campaign which will analyse the winning work from the Outdoor, Cyber and Film Lions to measure what percentage of the winners had a female creative lead. The results will be delivered as short targeted animations on Facebook and viewers will be encouraged to sign Creative Equals' 50:50 pledge. The move follows the launch of Campaign's #CampaignforEquality which has seen a broad range of industry leaders come together to recommend tangible action points to drive equality in the creative industries. The results are likely to shine a light on the continuing gap between rhetoric and reality when it comes to diversity and inclusion in the creative industries. According to the 2016 Cannes Data of Creativity report, for the past decade female creative leadership has represented only 9.8% of the total global leadership. The festival will also see the launch of joint research from JWT New York and the Geena Davis Institute on Gender in Media. 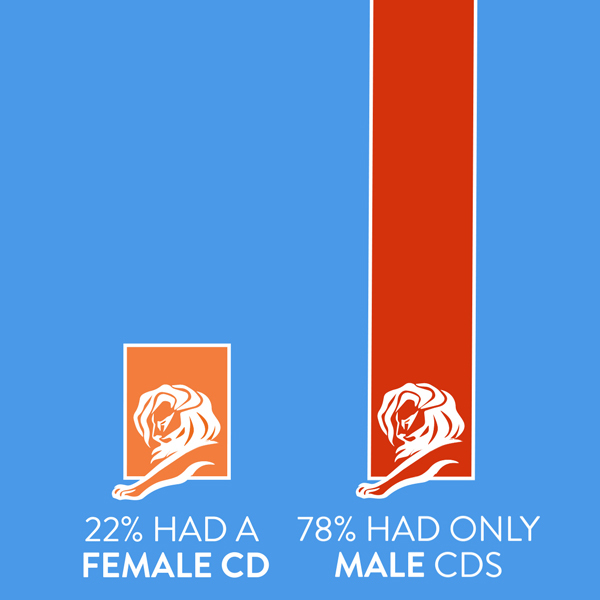 The research analysed 2,000 films from the Cannes Lions archive and used an automated system to analyse gender representation in advertising. The research showed that men were shown on screen about four times more than women and that men speak about seven times more than women. Kat Thomas and Simon Sworn, the creative directors at JWT London behind the campaign, said: "The need for more female leaders is clear. Every year we look to Cannes to set the industry standard, usually done by their winner lists. What it isn’t so obvious is what is usually missing from those lists - the lack of female led work. It’s not about lack of talent, it’s about lack of existence." Ali Hanan, founder and chief executive of Creative Equals, added: "This ‘filter’ will highlight another data point that shows the lack of female representation in creative departments, which is what Creative Equals is here to change. "While many brands talk about how creative work should reflect the modern world as initiatives like Unilever’s ‘Un-stereotype’ show, the fact is when we shine the light about teams and those who make creative work entered for Cannes Lions, there is a long way to go in terms of equal representation." Have we reached peak empowerment in marketing to women?